God bless Marquise Goodwin, and his wife Morgan. I hope time will heal the hole in their hearts, and allow his wife to recover fully. Very, very difficult time. Happy the 9ers paved the way to give him space. Unfortunate that one or two on this blog immediately reacted to his absence many weeks ago with sharp anger, implicitly calling him out for for being soft and the 9ers for coddling. And no one had a clue what was happening. Knee jerking at its best. Hats off to Marquise and the 9er organization. Thanks for the article Grant. 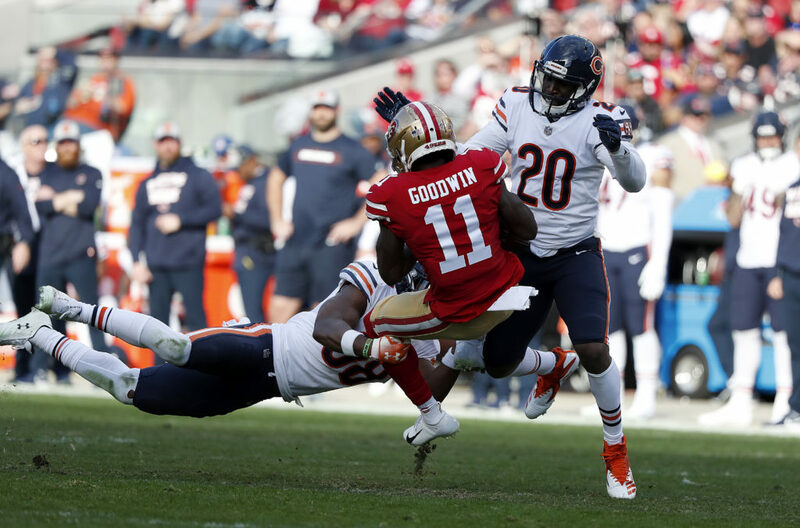 Goodwin seems like such a good person. Hate to see this happen to he and his wife. I am a believer and I do think God has a plan so I hope they find comfort in their faith. Hard to not be mad at God in these situations though. Hopefully, if they continue trying to have kids they won’t have to endure this pain again. There’s talk around town that calls into question Polite’s work ethic and character. My prayers and love continue to go out to the Goodwin family. Marquise has had to deal with too much tragedy in the pass two years, I wish him well in the future. Thanks Kyle for thinking and knowing it’s always “Family First”. Best of luck to the Goodwins. May they be blessed. A golfing buddy of mine told me that the side judge that was closest to the non call in the Rams/Saints game is from LA and there’s a pic of him on instagram exchanging jerseys (Shirts)with McVay after the game!! Could this possibly be true? Roger, you got some ‘splainin’ to do! What’s also funny….on this morning’s Dan Patrick show (2nd hour I think), Dan reported that Rams fans submitted a petition challenging the makeup of the officiating crew for the LA/NO game–in advance of the game. Evidently, one of the refs had a record of penalty calling very unfavorable to the Rams–and fans being fans, they were crying foul. Now Jerry Rice says the 49ers should trade the No. 2 pick for Antonio Brown. When did Rice become the 49ers’ GM? How is he helping John Lynch? Is Grant aware that he’s been playing 9er GM for quite a long time? At the very least it shows how out of touch former players can be. Rice was a hell of a player but he is no GM. You know we talk about a players 2nd or 3rd year in the league and the expectations, but we rarely talk about Lynch’s 3rd year in the upcoming draft and F/A. I for one am excited to see how much better he can be this go around…. I mean Grant himself has been playing 9er GM…among other things. It is funny coming from a blogger who’s job is to basically do such things, but Grant’s not wrong. Giving up the number 2 pick for a guy that’s on the other side of 30 and isn’t a qb, is a good way to get fired if you’re a GM. Hadn’t heard that more recently. He apparently admitted it had been an issue a while back for him but wasn’t anymore. It will be interesting to see how Ferguson measures up next to Sweat however I think both of those players are out of scope for this team unless one slips into the second. I will be checking the DB’s and interior linemen more in the senior bowl than any of the other positional groups. Given my draft expectations. This was meant to posted under Razor’s comment on Polite. Many on this blog opined that this is what must have happened and they were right. Nothing nefarious here, in my opinion. So, maybe obtaining good coaches is what’s best for the 49ers. Like an OC? KS can promote from within, and obtain good new coaches. More evil surrounding the Chiefs/Pats game…. Was it a fan? Was it a ref? A disgruntled network exec? Deebo Samuel looks like he could be Garcon’s twin in pads. Montez Sweat is going to be a mid first round pick when it’s all said and done. I’m looking forward to watching Nasir Adderley. He is possibly the best FS prospect in the draft from what I’m reading. Deebo is bigger than Goodwin though. Yeah, that’s what I said about him previously. If Shanny likes Garcon he will probably like Samuel. Deebo is probably shiftier than Garcon ever was though. Maybe just informing Hard Knocks that they would have to bleep every other word spoken in that program if Niners are chosen? Mood, They’ve not bleeped anything in any of the seasons I’ve watched. I think you have to work blue as a coach to even be considered. Oscar Mayer is looking for Wienermobile drivers… Sebbie, here’s your big break! Better hurry, you may be competing with Grant! Have you always dreamed of working with hot dogs? Well, look no further. All of your hot dog dreams just came true. We could say “drivers wanted,” but what we really mean is WIENERMOBILE navigators ready to deliver unlimited joy to thousands of people every single day. On the subject of the senior Bowl: Kyle Shanahan will allow LaFleur and McDaniel to split the play-calling duties during the Senior Bowl, which is a nice feather in the cap of their future résumés. Additionally, it was nice to hear Kyle’s reasoning for blocking some of his young assistant coaches from interviewing around the league. And my golly, low and behold, it makes a ton of sense. If only some reporters and the sheep who follow, would at least afford an opportunity to hear the reasoning and listen to all sides of any situation before jumping to conclusion. Apparently Kyle respects his assistant coaches taking advantage of opportunities to further their careers (despite being currently bound by contract) while taking positions on other staffs provided these are truly promotions, rather than lateral moves. San Francisco initially blocked an interview of quarterbacks coach Rich Scangarello by the Denver Broncos. The team later granted the request, and Scangarello was hired to be Denver’s new offensive coordinator. Mike Klis of 9NEWS in the Denver reported that the two sides came to an agreement after Shanahan was assured that a Scangarello-to-Broncos scenario would be a clear promotion. Once Kyle was given this assurance, he was happy to the Broncos permission to interview Scangarello. The 49ers did deny several teams permission to interview wide receivers/passing game coordinator Mike LaFleur and run-game coordinator Mike McDaniel because neither was being offered a position of promotion, and were told neither would be given play-calling responsibilities. Kyle Shanahan has received his share of criticism over the years. Some of it valid. However, his players love him, and I’ve yet to hear anyone who has had a coaching relationship with Kyle who have described him as anything other than on the level, straightforward, and honest. Same goes for John Lynch! That was years ago, so I will defend KS. That article also dissed Sean McVay and Matt LaFleur as being too green, but both are HC’s, and McVay is playing in the SB. Sure, it was a 3-10 team and RGIII was benched, so there was a lot of grumbling. That is to be expected, just like a 4-12 HC. I think KS has learned and grown from that experience. He has 2 seasons of being a HC, and it sure seems like the Niner locker room is solidly behind KS. Foster was the biggest distraction, but now he will be a headache for Washington. I fully expect Foster to implode. KS, with his salty language, is sure sounding like an NFL HC. Thankfully, the players are buying in, and seem to be having fun, while working hard. Wasn’t my point, my post was in response to 49 Reasons who claimed that players and coaches had not criticized him. They have. Ryan did recently as well. So did the Atlanta fans. KS may be a great coach in the future, but he is still very raw and a guy who has greatly benefited from who he knows. The criticism of him in Washington was one I heard prior to his arrival here and it is one that should be at least food for thought. Some posters treat him as if he walks on water and they rush to defend even benign criticism of his tenure. I still don’t understand how an unproven coach can pull this off. I am and continue to be on the fence with him and Lynch. They have made numerous errors that have slowed the rebuild. Additionally they have pulled a few rabbits out of the hat too! If you remember I compared this team to a new franchise because of all the new players. In order to be competitive as a franchise starting out very good moves have to be made in FA and the draft. This team certainly could have done better in both areas. I think that the general grade is a moderate sense that the team is on the right track. I know that many pundits (and even Vegas) think this team has a decent chance at a Super Bowl opportunity next year. I assure you a lot (and I mean a whole lot) has to go right for or this team to pull that off. I have to see them win consistently before I’m even willing to sign off on post season competition. I just want to see what he can do before we crown him king. Sutton Smith abused by Lindstrom not once, but twice. Yikes! Charles Omenihu, iDL, Texas reverse pancaked Deiter. Isabella says he runs a 4.26 and I think Shanny will love him. Isaiah Johnson, CB, Houston is said to be in the 4.4’s at 6′ 2″ tall and weighing over 200lbs., 34″ arms. Shut down Samuel and Sills V.
Isabella dropped 4 passes today. Was not impressive today according to reports. Stop messing around with these kind of Wrs. Go get the best in the game who wants to wear red and gold. Antonio Brown changes the fortunes of this franchise. Don’t let this opportunity go by. He also only measured 5’8″ 7/8 and 186 pounds. The earliest I would take him would be round 5. Not an option to replace Garcon, and not able to play multiple receiver positions. Pure slot. Taking the notes from NN, sounds like Montez Sweat, Renell Wren and Daylon Mack had a good practice. Josh Allen should have participated. Germaine Pratt and Te’von Coney showed good skills. Isaiah Johnson shined, but sorry, Juan, Thornhill did not. Unfortunately Nasir Adderly also struggled. Kris Boyd excelled in press, and Darnell Savage was the only DB to stay with Isabella. On the offensive side, there was no mention of the QBs, but it sounded like they did well because the WRs dominated.Gary Jenning, David Sills V and Deebo Samuel all made catches and were smooth and fluid. Andy Isabella had a good practice. He sounded uncoverable, but dropped passes. However, Keelan Doss will be in every one of my mocks, if he is remotely available. Ben Powers and Uli Udoh did well, Kaleb McGary dominated. Perusing the other blogs, sounds like Drew Lock had the best day at QB. Grier missed his first couple passes. Minshew and Stidham had good placement. KS coaching in the Senior Bowl is a good opportunity to see players with hands on instructions. Wonder how certain players fit into KS’s scheme. Sounds like the players are buying into his system. Hope KS can make knowledgeable assessments that will help in the draft room. Still wonder how the QBs did, for both the North and South. I also want to commend KS for allowing his Run game coordinator and Passing game coordinators to call the plays, so they get OC training.